Saïs was the capital city of Egypt in the 26th Dynasty, from 664-525 BC, a period of increasing trade with the Aegean and Eastern Mediterranean, as well as of religious, social and economic change within Egypt itself. Although largely destroyed, the site of the city had been explored very little until this project began in 1997. The main aim was to understand the development of this royal city in its geographical, historical and social contexts. 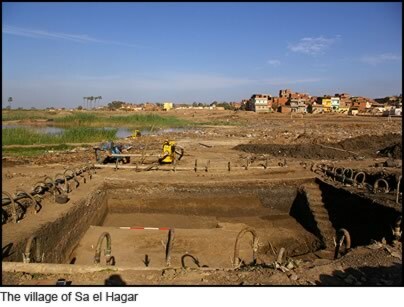 The project combines regional survey work, targeted excavation and various types of surveys at Saïs (near the modern town of Sa el Hagar) to investigate the reasons for settlement development, growth and abandonment from the Neolithic to the Late Antique period in the north-west of Egypt. The project is was funded by the AHRC from 2002 to 2007 and then by small grants administered through the Egypt Exploration Society and Durham University from the British Academy and Wainwright Fund, amongst others. The results of the project include the discovery at Saïs of an Early Neolithic fish midden site, a Middle-Late Neolithic settlement, Buto-Maadi Period settlement, a Ramesside town house, a First millennium BC town; a Saite sacred zone and buried buildings. In addition, the later Ptolemaic and Roman dismantling and destruction of the city is attested through pottery dumps and discarded stone fragments. A Late Antique church and the modern development of the city ensures that the site biography covers over 6000 years of human life in Sais to the modern day. A storage and display facility is being built at Sa el Hagar to disseminate results of the project and about the site to local people, visitors, tourists and students. As results are published in a series of monographs, the key themes of the site are: regional control; river-power; external and internal connectivity and the impact on individuals within a state system; recycling and destruction as part of the fabric of Egyptian urban centres. Current work, undertaken as a collaborative project with the Supreme Council of the Ministry of Antiquities in Egypt, is focussed upon the town site of the First Millennium and the way in which is became a royal city by the seventh century BC, as well as the links between Sais and her daughter ‘emporium’ at Naukratis, to the west. Louise Bertini. 2011. Changes in Suid and Ovidcaprine Husbandry Practices Throughout Dynastic Egypt Using Linear Enamel Hypoplasia. Wilson, P. (2011). Sais I The Ramesside-Third Intermediate Period at Kom Rebwa. Egypt Exploration Society. Wilson, Penelope (2011). Pots, People and the Plural Community: A case Study of the Greeks in Egypt at Sais. In Intercultural Contacts in the Ancient Mediterranean. Proceedings of the International Conference at the Netherlands-Flemish Institute in Cairo, 25th to 29th October 2008. Duistermat, K. & Regulski, I. Peeters. 149-160. Wilson, P. (2006). The Survey of Saïs (Sa el-Hagar), 1997-2002. London: Egypt Exploration Society.